Materials: Ficus Religiosa (Bodhi Tree) Skeleton Leaves, resin, phosphorescence. 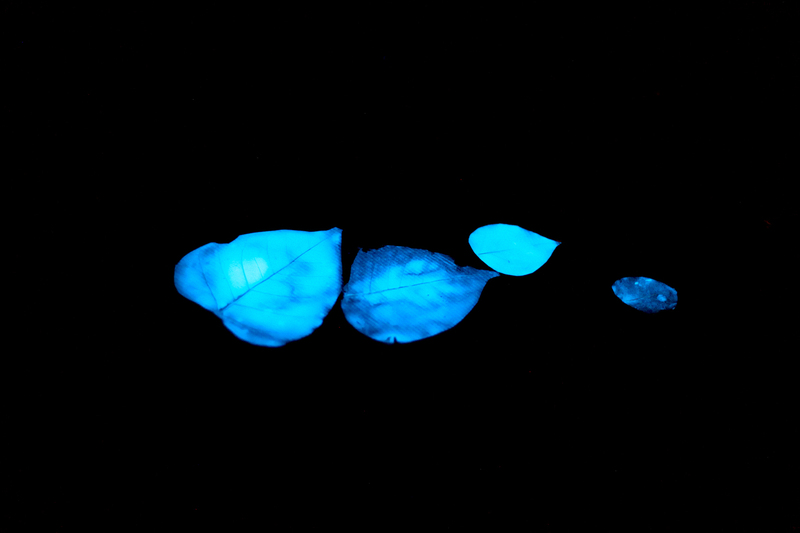 Project: I will float 1000 resin and phosphorescence-coated leaves in a small pond. During the day the phosphorescence will collect and absorb energy from sunlight, at night the leaves will emit a soft, blue glow. This is a 24 hour project. On May 31, 2012 I will put forth a site-specific project which celebrates Puerto Rico’s beautiful natural phenomenon of Bioluminescence while paying homage to the history of boat travel and refugees in the country. I intend to create this project utilizing renewable, ecologically friendly materials in contemporary forms. This project is inspired by nature and connects natural elements in an expression of contemporary art. My hope is to incorporate community participation in the creating and discussion of this work. The concept is to create small ‘boats’ fashioned out of skeleton Ficus leaves. The Ficus tree is native to Puerto Rico and would serve as an ecologically friendly, poetic notion of a floating, ephemeral boat, utilizing native flora. I will coat the leaf boats with non-toxic, ‘daytime invisible, night time luminous’ phosphorescent pigment. This phosphorescent pigment ‘charges’ with sunlight during the day as the boats float on a small pond or body of water, at night in darkness the boats will emit a soft glow for a short period of time. This is a temporal project, as the leaves will be floated on a pond or small body of water and will eventually biodegrade and become part of the environment. My intention is to communicate a poetic notion of interconnectivity and create an opportunity to quietly take notice of the beauty in nature. This piece is inspired by the ancient Japanese festival of Obon, a ceremony to honor and commemorate the departed. Obon is an ancient event, which occurs every 15th day of the 7th month of the Lunar Calendar (mid-August). It is believed that during this 3 day ceremony the spirits of one’s departed family members and ancestors return to the home and are reunited with their loved ones. Lanterns are hung inside the house to welcome the spirits inside and on the evening of the last day of the ceremony, lanterns are floated on rivers to guide the spirits back to the netherworld. There is a beautiful, non-denominational notion of respect, interconnectivity, history, and memory that is celebrated with the festival of Obon. I have been working for the past 4 years on a series of non-denominational, large-scale public works for spiritual spaces. My intention is to pay homage to the unique history and beautiful naturally occurring phenomenon of Puerto Rico. I would like to create a work, which gently and mindfully integrates with the preexisting natural environment of Dorado. By utilizing renewable, ecologically friendly materials I would like to suggest that it is possible to create contemporary public works while protecting and respecting the environment. The luminous ‘Obon’ project is an expression of the universal and non-denominational spiritual notion of memory and respect. I hope to put forth this project with an intention of respecting universal beliefs and spiritual traditions, while paying homage to tradition. The intention of this project is to serve as an opportunity to take a moment to become aware of the beauty in the universal transitoriness of nature and life and create an environment of serene reflection, wonder and peacefulness.